There are many things that Anthony Bourdain has done, that I will probably never do. Managing to sound eloquent with a camera pointed at his face, is one. Mastering an iconoclastic, Bob Dylan-esque coolness is another. But, up a bustling street, down the way from a Caribbean seain the walled city of Cartagena, I found a commonality with the God of food and travel. The allure of it is simple and yet difficult to put my finger on. Something about the thought of that wall, all studded with seashells, looking out over the Caribbean. Something about the sea air rushing down the alleyways and finding this humble little seafood joint. Something about fresh fish that’s been tinkered with ever so lightly. The more I read about it, the more cemented it became in my to-do list and by the time we were wheels down in Colombia, I’d decided that if I lost a leg in a hang-gliding accident and I was being med-evacced out of the country, I’d force the helicopter down on the roof of that place. Fortunately for us, no forced landing was necessary. 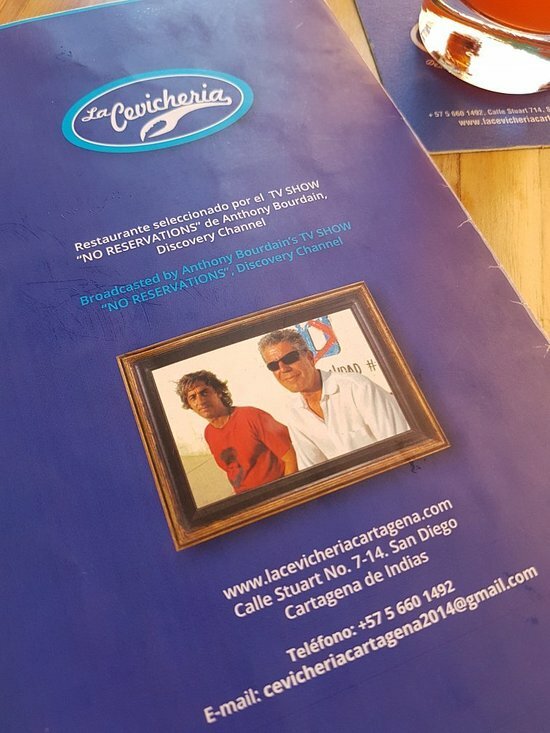 After a sweaty walk through the steamer heat of a cloudy Colombian day, Melissa and I found ourselves at the front door of La Cevicheria. A waitress jotted our names down and told us to come back in about 20 minutes. A five-minute walk got us to the wall, some stairs took us to the top of it. Wind and sand and the desperate bleating of cars on the roadway. A dramatic looking sky oozing with clouds and a sea painted with chop. We walked back through the tourist-choked streets, past a gauntlet of street vendors slinging goods at us, “no gracias, no gracias”, restaurant employees hopelessly waving menus at us like we weren’t on our way to some of the best ceviche we would ever have. The waiter came back and I ordered something called a caipirol, another twisty classic. Caipirinha fixings, (sugar and lime) but with aperol. It came out tart and bitter and red like a jilted Ed-Sheeran at the beach and I loved it. We were minding our own business like that, chips in our teeth, cheeks full of tropical bang bang, watching life swirl around our table, when our waiter came back out and sucker punched us with arguably the best meal of the trip. Just dropped it in front of us like we weren’t going to freak out and wake up in a Colombian crazy house three days later. I don’t know how we kept it together, but we did. Two dollops of mashed sweet potato, plantain tostones smeared with avocado, and a pile of Andean cancha (toasted corn) in a halo around a mound of heavenly fish and shrimp. It is a pastel explosion of colors and flavors that I haven’t stopped thinking about since I grunted with the first forkful, and groaned with the last. The sweet potatoes brought the sweet and the cancha lent some salty. The avocado was creamy and the tostones were crunchy. You shut your goddamn mouth about that Peruvian-style ceviche. Tangy and meaty and spiked with the sea and the wind and all the things you love about them both. It was everything that ceviche is supposed to be. Probably the best I’ve ever had. What about the spicy, Kellen? You’re talking about how balanced and perfect everything was, but what about the spice? Oh, I’ll tell you about the spice…. 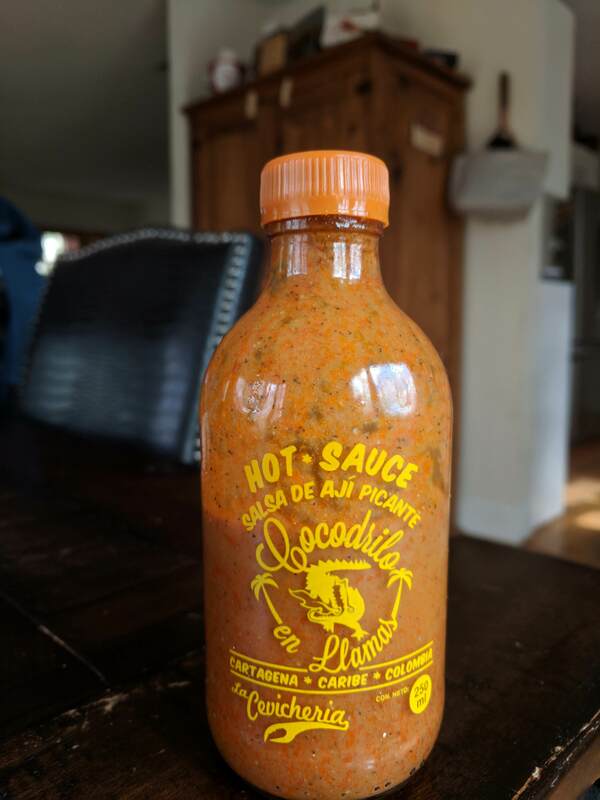 At my wife’s behest, the waiter brought us out a bottle of house-made hot sauce. It was electric orange in a little glass jar and the waiter carried it out to us with his arm outstretched like he was carrying a grenade that he had no intention of detonating. “Be very careful,” he said, which sounded like a funny joke but just turned out to be really good advice. Napalm but zesty. Sterno, but delicious. We left it in a deadly pool at the edge of our plates, dipped our food in it to make it dangerous and fantastic while the sweat beaded on our foreheads and the giggles bubbled in our throats. On the back of the menu in that magical restaurant, there was a photo. 2×2 in the middle of the laminated page. Bourdain and the owner, smiling on the street out front. There are many things that I will never share with Anthony Bourdain. Slithery coolness. Sweet cowboy boots. But the smile on his face on the street in front of La Cevicheria in the blushing heat of Cartagena… We’ll always have that. I composed this article a week ago, before we lost him. Bourdain was an inspiration for me. He traveled. He ate. He told the truth, the way he understood it. More than ever, I am honored to have shared something with him. Even just a love for food and discovery. Even just a table, decades apart.